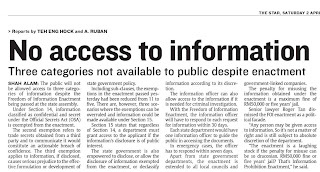 SHAH ALAM: The public will not be allowed access to three categories of information despite the Freedom of Information Enactment being passed at the state assembly. Under Section 14, information classified as confidential and secret under the Official Secrets Act (OSA) is exempted from the enactment. The second exemption refers to trade secrets obtained from a third party and to communicate it would constitute an actionable breach of confidence. The third exemption applies to information, if disclosed, causes serious prejudice to the effective formulation or development of state government policy. Including sub-clauses, the exemptions in the enactment passed yesterday had been reduced from 11 to five. There are, however, three scenarios where the exemptions can be overruled and information could be made available under Section 15. 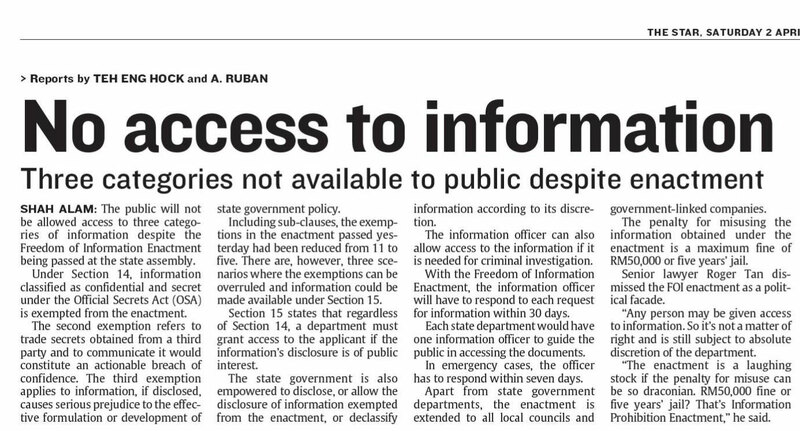 Section 15 states that regardless of Section 14, a department must grant access to the applicant if the information's disclosure is of public interest. The state government is also empowered to disclose, or allow the disclosure of information exempted from the enactment, or declassify information according to its discretion. The information officer can also allow access to the information if it is needed for criminal investigation. With the Freedom of Information Enactment, the information officer will have to respond to each request for information within 30 days. Each state department would have one information officer to guide the public in accessing the documents. In emergency cases, the officer has to respond within seven days. Apart from state government departments, the enactment is extended to all local councils and government-linked companies. The penalty for misusing the information obtained under the enactment is a maximum fine of RM50,000 or five years' jail. Senior lawyer Roger Tan dismissed the FOI enactment as a political facade. “Any person may be given access to information. So it's not a matter of right and is still subject to absolute discretion of the department. “The enactment is a laughing stock if the penalty for misuse can be so draconian. RM50,000 fine or five years' jail? That's Information Prohibition Enactment,” he said.